FRESNO, Calif. (AP) — A giant wildfire raging out of control grew to nearly 200 square miles and spread into Yosemite National Park on Friday, as California Gov. Jerry Brown declared a state of emergency for the city of San Francisco 150 miles away because of the threat to the city's utilities. The fire hit the park at the height of summer season, as officials geared up for a busy Labor Day weekend. It has closed some backcountry hiking but was not threatening the Yosemite Valley region, one of California's most popular tourist destinations that features such iconic sights as the Half Dome and El Capitan rock formations and Bridalveil and Yosemite falls. The weeklong blaze on the timbered slopes of the Western Sierra Nevada has spread to 196 square miles and was only 5 percent contained. 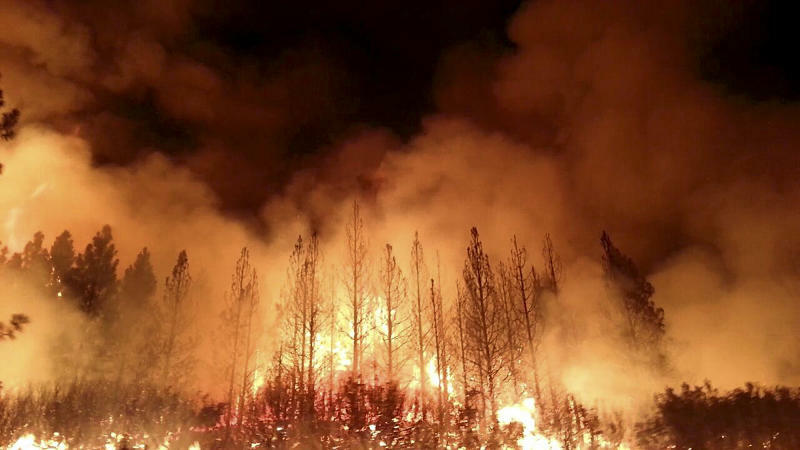 It continued to grow in several directions, although "most of the fire activity is pushing to the east right into Yosemite," said Daniel Berlant, spokesman for the California Department of Forestry and Fire Protection. "We don't have anybody we know of in that area based on the permits we have out now," she said. The fire was more than 20 miles from Yosemite Valley and skies there were "crystal clear," Cobb said. "Right now there are no closures, and no visitor services are being affected in the park," he said. "We just have to take one day at a time depending on fire activity." "It feels a little bit like a war zone, with helicopters flying overhead, bombers dropping retardant and 10 engine companies stationed on our street," said Ken Codeglia, a retired Pine Mountain Lake resident who decided to stay to protect his house with his own hoses and fire retardant system. "But if the fire gets very hot and firefighters evacuate, I will run with them." Officials previously advised voluntary evacuations of more than a thousand other homes, several organized camps and at least two campgrounds in the area outside the park's boundary. "We usually book out six months solid with no vacancies and turn away 30-40 people a night. That's all changed," Edwards said. "All we're getting for the next three weeks is cancellations. It's a huge impact on the community in terms of revenue dollars." Associated Press writers Jason Dearen, Lisa Leff and Andrew Dalton in San Francisco also contributed to this report.